First, Does anyone know how to access to abundance of chocolate bunnies, the day after easter? Please comment on this post if so. Or email farmer (at) thegreenhorns (dot) net. And next, a DIY project for your easter eggs, from friend and kitchen greenhorn Susannah Hornsby of the Ginsberg Historical Society in the East Village in NYC. 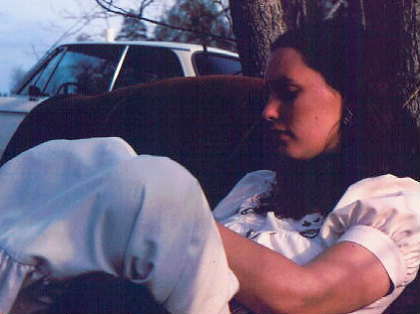 My mother (pictured above at the farmhouse in Toano) collects bird-nests. By now she has dozens of them, and each one has a story, ‘this tiny one is from the barn at the farmhouse in Toano where you were born.’ Her favorite nest, a delicate little number thatched with horse-hair and poets laurel, sat on a bow-front chest in her bathroom, and held three sepia-colored eggs blown hollow and covered with gossamer photo-negative outlines of tiny ferns, clovers, and gingko leaves. 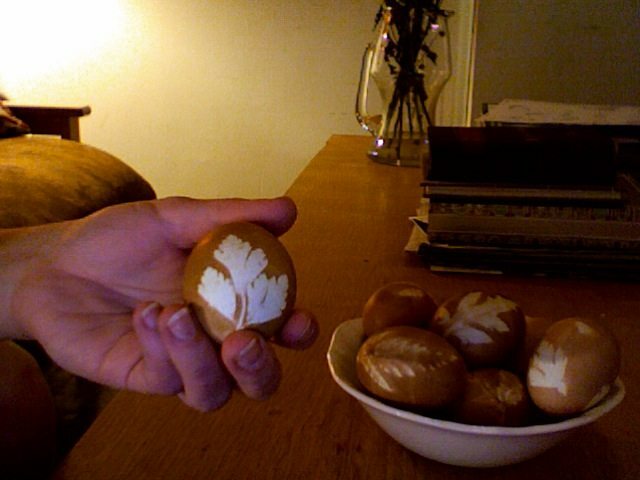 I decided this afternoon to make myself some of these beautiful eggs. Instead of traditional dye, the sepia eggs of my youth are made by boiling the egg alongside yellow onion skins (easily acquired for free, especially in the north-eastern-winter-time-farmers-market glut of root vegetables). Sepia isn’t the only color option, though, there are many variations of natural pigments that can be used to imbue the eggs with sweet, tender, and genuine colors not found in a little tear-drop of McCormick food coloring. For yellow eggs, try stargazer lily stamens (use a non-reactive pot and watch your apron! ), for purple-blue use beets, for green eggs (ham, foxes, and boxes not included) try spinach. Have some friends over, experiment, make a ricotta frittata with the egg you have left over, and have a happy spring.